Herman’s Hermits were one of those odd 1960′s groups that accumulated millions of fans, but precious little respect. Indeed, their status is remarkably similar to that of The Monkees and it’s not a coincidence that both groups’ music was intended to appeal to younger teenagers. 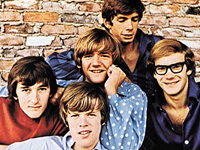 The difference is that as early as 1976, The Monkees began to be considered cool by people who really knew music; it has taken 35 years for Herman’s Hermits to begin receiving higher regard for their work. Of course, that lack of respect had no relevance to their success: 20 singles lofted into the Top 40 in England and America between 1964 and 1970, 16 of them in the Top 20, and most of those Top Ten as well. Artistically, they were rated far lower than the Hollies, the Searchers, or Gerry & the Pacemakers, but commercially, the Hermits were only a couple of rungs below The Beatles and The Rolling Stones. Of course, that statement assumed that the group had much to do with the record — as it turned out, they didn’t. In a manner typical of the majority of the acts that Most produced, the Hermits didn’t play on most of their own records; Mickie Most, as was typical of producers in the era before The Beatles‘ emergence, saw no reason to make a less-than-perfect record, or spend expensive studio time working with a band to perfect its sound — as long as Peter Noone’s voice was on the record and the backing wasn’t something that the group absolutely couldn’t reproduce on stage, everyone seemed happy, including the fans. Conversely, the group didn’t have too much control over the choice of material that they recorded or released. On their singles in particular, “Herman’s Hermits” were mostly Peter Noone’s vocals in front of whatever session musicians Most had engaged, which included such future luminaries as Jimmy Page and John Paul Jones, with the other members relegated to background vocals, if that. The group was grateful for the hit records that they chalked up, the revenue that those generated, and the gigs that resulted. They charted six Top 20 hits each in the years 1965 and 1966 and were a major attraction in concert, usually in a package tour situation, with the Hermits at or near the very top of whatever bill they were on. Their records were smooth, pleasant pop/rock, roughly the British invasion equivalent of easy listening, which set them apart from most of the rival acts of the period. Their cover of Sam Cooke’s “Wonderful World” (which reached number four in America) and remake of the Rays’ 1950s hit “Silhouettes” were good representations of the group’s releases; on their EPs and early LPs, they also threw in covers of old rock & roll numbers like Frankie Ford’s “Sea Cruise.” They were purveyors of romantic pop/rock just at a time when The Beatles were starting to become influenced by Bob Dylan and The Rolling Stones, The Yardbirds, and the Who were redefining the British beat sound with higher volume, greater complexity, and harder sounds.